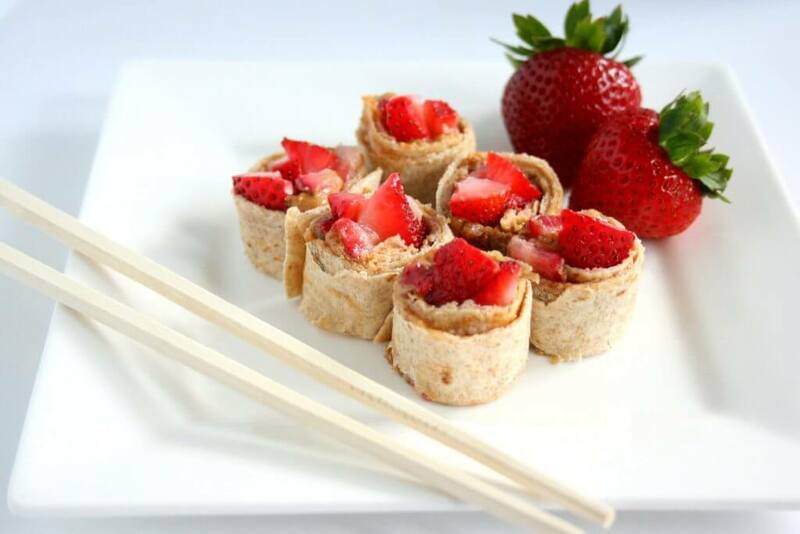 Just in time for back-to-school, my delicious and simple 3 ingredient, 5 minute PB & Strawberry Sushi. Your kids will love this fun and tasty lunch! Ready to look like an all-star lunchbox packing mom that is sure to impress your children? The ingredients in this recipe are simple and ones that you likely have on hand: peanut butter, strawberries and a tortilla. If your child has a peanut allergy or the school is peanut free, substitute with almond butter or cashew butter or for a nut-free option, use sunflower seed butter. 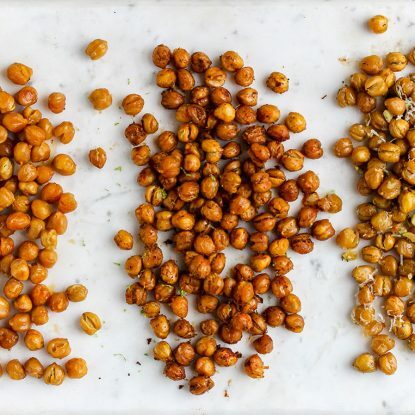 They all work equally well providing a source of healthy fat and plant protein. Did you know that strawberries are an excellent source of vitamin C? They even have more vitamin C per serving than an orange! 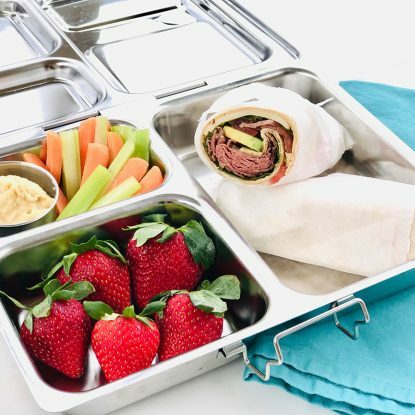 Plus, strawberries are packed with key vitamins and nutrients, rich in fiber, and the perfect addition to a naturally-sweet summer treat or bento box lunch. Serve with chopsticks for a fun twist on the typical bento-style box! 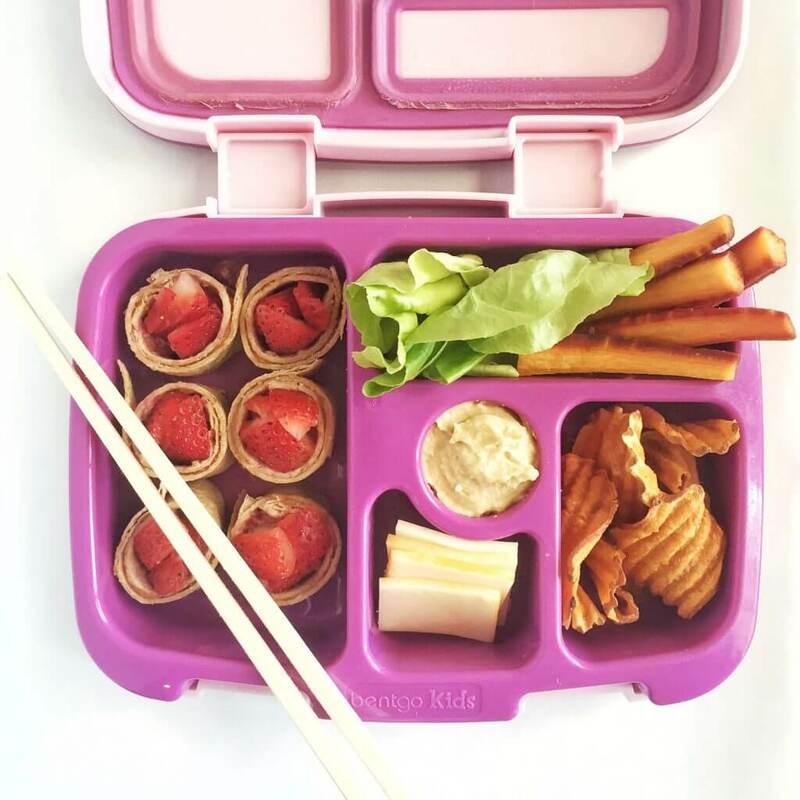 Whether I pack this PB & Strawberry Sushi in Ellie and Frances’s #healthylittlelunchbox or make it for myself and serve with a salad, I love that I always have the ingredients on-hand. Place tortilla on a cutting board and spread one side evenly with peanut butter making sure the peanut butter reaches the edges. Place strawberries in a line on one side of the tortilla. 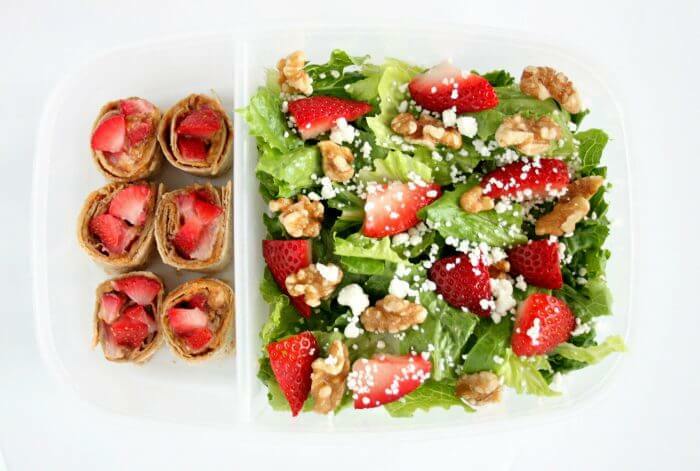 Roll up tortilla beginning on the side with strawberries. 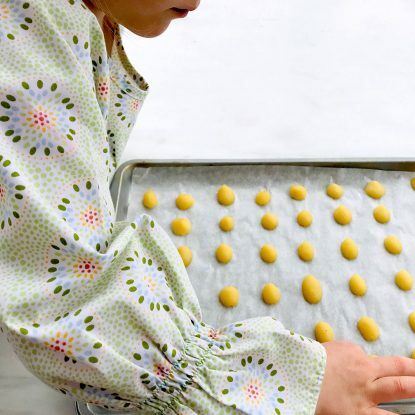 Once rolled, ensure the edge is “sealed” with additional peanut butter if needed. Cut the roll into 1 inch pieces using a sharp knife and arrange on a plate/ lunch box with cut side facing up. 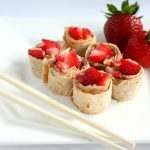 Just in time for back-to-school, my delicious and simple 3 ingredient, 5 minute PB & Strawberry Sushi! Your kids will love this fun and tasty lunch!